Grafters at Log House Plants in Cottage Grove believe two tomato varieties are better than one for forming a single, vigorous and prolific plant. Rising above the competition: Two-vine ‘Big Beef’ tomato at right, grafted onto hardy rootstock from Holland, dwarfs two-vine ‘Big Beef’ tomato, left, growing on its own root. Photo was taken last October at Log House Plant’s family-style garden above Dorena Lake. 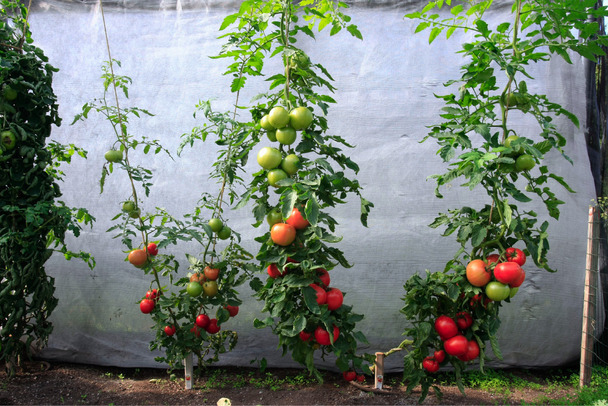 Log House Plants uses the Japanese style of vegetable grafting to make one tomato plant out of two. Working meticulously — the splice must be a perfect fit to work — grafters cut a stem of one popular tomato varietal into the rootstock of another plant prized for its vigor. The graft, at a 45- degree angle, is held in place by a tiny plastic clip until the plants fuse together and heal. If grafted tomatoes end up yielding superior bounty by season’s end, it’s because they’re working on a buddy system new to home gardeners. 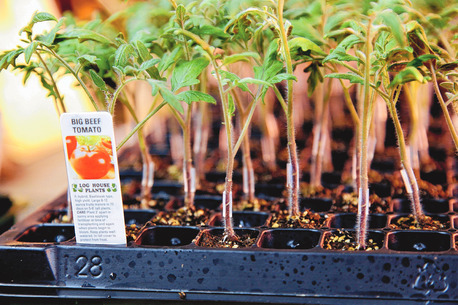 This spring, Log House Plants near Cottage Grove became the first wholesale nursery in the United States to graft tomatoes for its retail accounts, say owners Alice Doyle and Greg Lee. Inspired by commercial techniques long used in Europe, Asia, Australia, Canada and especially Greece, grafters at Log House Plants work like surgeons to splice the tip, or scion, of one plant into the rootstock of another. “When their tissues heal, they fuse into one super plant with the best qualities of each,” states Doyle in introducing the nursery’s brand-new “SuperNaturals Mighty ’Mato” grafted line. The tomato twosome gets its hardy side from the rootstock, but taste and overall fruit quality from the grafted-in scion, whether it’s ‘Big Beef,’ ‘Brandywine,’ ‘Sun Gold’ or some other varietal. In homestyle test gardens at Log House Plants above Dorena Lake last summer and fall, Doyle and Lee planted grafted tomatoes right next to regular tomato plants. No contest: The grafted varietals literally towered over the competition on their rope trellises, bearing fatter fruit and more of it. “I didn’t notice any difference between grafted tomatoes and nongrafted,” says Josh Kirschenbaum, product developer for Territorial Seed Co., which has exclusive mail-order rights to Mighty ’Mato this year. Most local garden outlets are stocking Mighty ’Mato (see list of retailers at www.loghouseplants.com). Jerry’s Home Improvement Centers already have some plants, and other home-garden centers will receive shipments next week. Jerry’s prices are $12.99 for a gallon-pot tomato with one grafted variety, or $19.99 for a gallon pot with two grafts. Territorial already has sold out its 2-inch pots of double-grafted tomatoes at a price of $6.95 each. Eventually Doyle and Lee will add other veggies — peppers, eggplant, squash, cucumbers and melons — to their “SuperNaturals” grafted line. Grafting may be an old trick for some store-bought produce, but Doyle began pondering its home-garden potential about 10 years ago. She noted that commercial growers in Crete, plagued by soilbound nematodes, struggled to grow tomatoes without first sterilizing the ground. Yet they could grow tomatoes grafted to disease-resistant rootstock without using harsh sterilizing chemicals. Log House Plants grows the rootstock for its grafted tomatoes from Holland seed. Workers splice scion to rootstock at a meticulous 45-degree angle. “It takes the eye of an artist to do it, that’s for sure,” Doyle says. 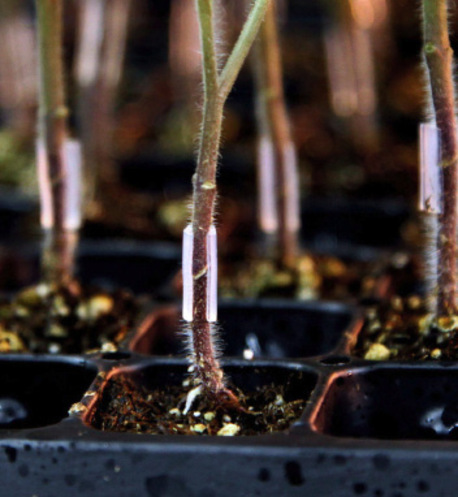 Tiny plastic clips from Japan secure the grafted plant stems while they fuse and heal for three days in a dark room maintained at 75 degrees F and a humidity of 85 to 95 percent. “You’re helping them remap and reconnect their vascular tissues in the dark without stress,” Doyle says. After fused and “weaned” back into the light, the grafted plants are twice the tomato they once were. “It’s not clear” if grafted plants will prove resistant to early and late blight, Doyle allows, but she’s hopeful. “You just have a healthier plant” because of the rootstock’s exceptional mass for uptaking water and nutrients, she says. Grafted vegetables already have been found to resist soilbound pestilences such as various wilts, tomato mosaic virus and root-knot nematodes. Unlike “regular” tomato starts — those on their own rootstock — grafted plants should be planted as they come in the pot. Burying the grafted part of the plant below ground will cause the upper part of the plant to take root, negating the benefit of the graft. Trellis the plants, such as with rope or twine, or plant them inside large, square, 3-foot-tall steel cages. Root tips, and the hairs on root tips, gather water and nutrients for plants. Crowding the roots of grafted plants inside a container will diminish returns. Space cages for grafted plants at least 2 feet apart. As with other tomatoes, plant in May and early June. Fertilize and water grafted plants as with other tomatoes. Grafted tomatoes from Log House Plants will be at the Lane County Master Gardener Fair & Plant Sale on Saturday, April 23, from11 a.m. to 5 p.m. at the Eugene Water & Electric Board’s River Edge Plaza, 500 E. Fourth Ave., Eugene.